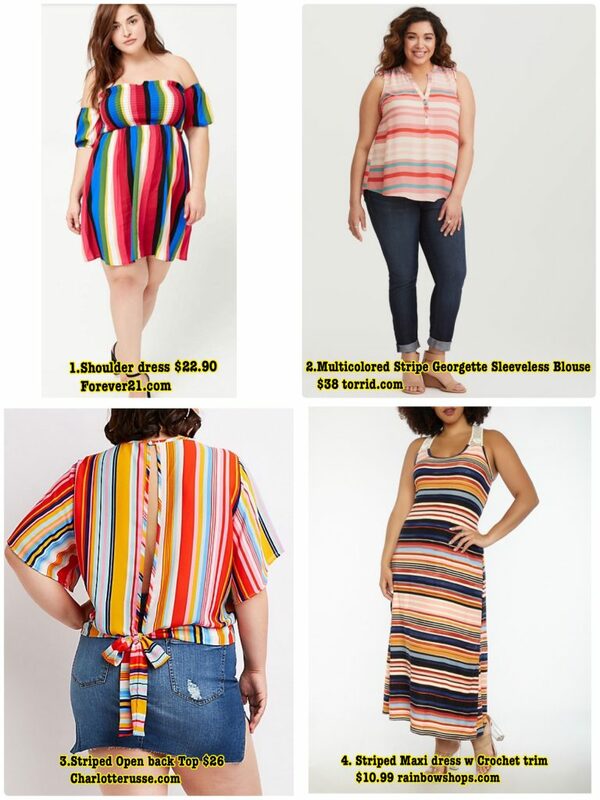 Curvy Chic:Spring 2018 Wear Candy Colored Stripes For Less!! I was flipping through the pages of another glossy magazine when I came across a new trend for Spring; wear rainbow stripes with a candy colored twist. I loved all the beautiful pops of delicious colors that reminded me of those rainbow mints you would see in your grand mother’s candy bowl or a doctors offices back in the nineties when you were a kid.. What I didn’t see was any suggestions for plus sized or curvy women and that bothered me a lot! We can rock stripes just as well as any straight sized woman! There is a huge myth going around that curvy girls can’t wear stripes as it makes us look bigger..I wear stripes all the time and I’m a size 16 and I don’t look any bigger..So get out your wallets take our guide and go get some yummy rainbow stripes! I have chosen everything under $40!